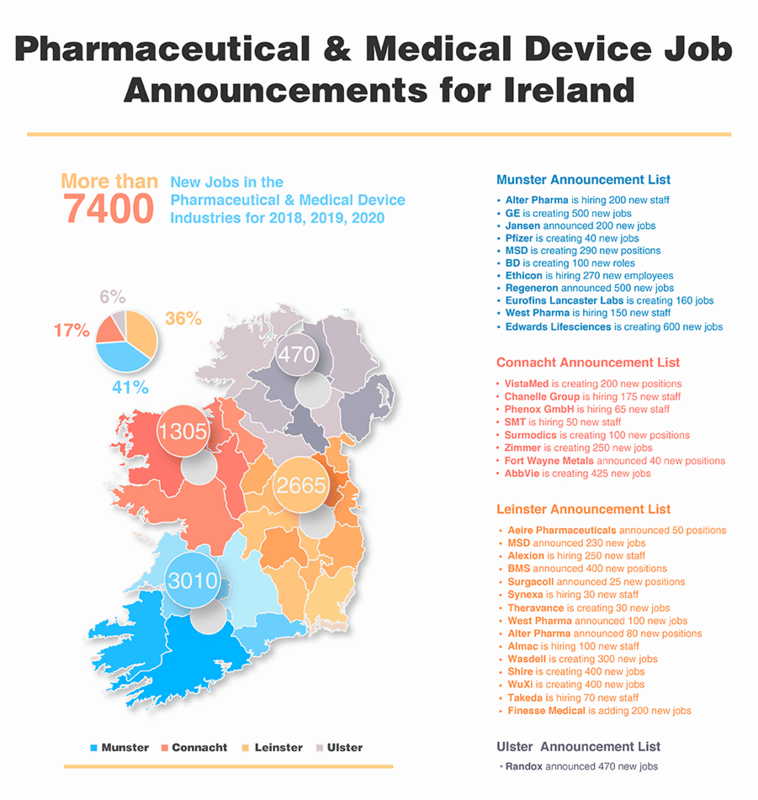 Ireland’s pharmaceutical and medical device industries have seen excellent growth over the last few years. If you want to know more about why check out this blog post. This growth has, of course, led to many companies looking to hire more staff. It can be difficult to keep track of which companies are still in the process of recruiting for these announcements so we thought we’d do it for you! The page contains a list of expansions plans and job announcements that could still be in the recruiting process. The links here are to news articles to let you see details of the announcements. To follow up, visit the company career pages or contact them directly. You can find a complete list of links to company career pages on our Job Website Directory. We’ll be updating this page regularly so check back every-so-often to see new announcements! Aerie Pharmaceuticals announced 50 jobs at a new manufacturing plant in Athlone. Alexion announced 200 jobs in Dublin and Athlone, with a second announcement of another 50 jobs in Athlone later in the year. Almac created 100 positions at a new Dundalk facility. Alter Pharma announced the creation 80 new roles by 2018 in Dublin, and a further 70 new jobs in Clare. BD announced 100 new jobs as it expands the Limerick facility. BMS is recruiting for 400 new positions as it opens a new biologic manufacturing plant in Dublin. Chanelle Group is creating 175 new jobs in an expansion of their Galway plant. CRI announced 25 new jobs as it expands the Wexford site. DiaNia Technologies is creating 20 new positions in Galway by 2018. Ethicon announced 270 new roles at a new plant in Limerick. Eurofins’ Waterford site is creating 160 positions. Fort Wayne Metals announced 40 new roles as it extends the Co. Mayo facility. Horizon announced 60 new positions in its new Dublin headquarters. IQ Pharmatek is creating 200 new jobs in Clonmel. Janssen announced 200 new jobs in Cork. Mallinckrodt announced 45 new jobs at a new engineering hub. MSD is creating a total of 530 new jobs (200 and 330 in separate announcements) across Carlow, Cork, and Tipperary. Ortec is creating 110 new positions in Limerick as it opens the new European HQ. Randox announced 470 new jobs at a new manufacturing and research facility. Regeneron is adding 500 positions in Limerick (across two separate announcements). SMT announced 50 new Galway jobs at its new European HQ. Synexa created 30 new positions in Dublin. Takeda announced 40 new jobs as it expands the Dublin site. Theravance added 30 new jobs in Dublin. VistaMed created 200 new jobs in Leitrim with a €10m investment in the site. Vitalograph added 50 new positions in Clare. Wasdell created 300 new positions at a new packaging facility in Louth. West Pharmaceutical is creating 150 new positions in Waterford and another 100 in Dublin. Zimmer announced 250 jobs at a new medical device hub. We hope you find this list useful and wish you luck with your job hunt! Want to know more about a mid-career move to pharma? Check out this “Is a Pharma Career For Me?” tool to see how suitable you are for a career in pharma or medical device manufacturing based on your career and educational history. Our eBioPharmaChem 30-week conversion course is FREE for Unemployed people in Ireland who qualify under the Springboard Scheme. If you are thinking of re-skilling into this sector and would like more information, contact us for details.